This is the statue of Chief Massasoit that stands in front of the Winstead’s Diner in Kansas City, Missouri and faces the Plaza. For those unaware, Massasoit and his Wampanoag tribe were the first Native Americans to forge an alliance with the three-month-old Plymouth Colony. In fact, they are largely responsible for keeping the clueless pilgrims alive during their early years. Chief Massasoit somehow managed to keep the peace for 40 years until his death in 1662. Shortly thereafter, his sons – most notably Metacomet or “King Philip” – took the fight to the colonists, leading to one of the bloodiest wars in American history. 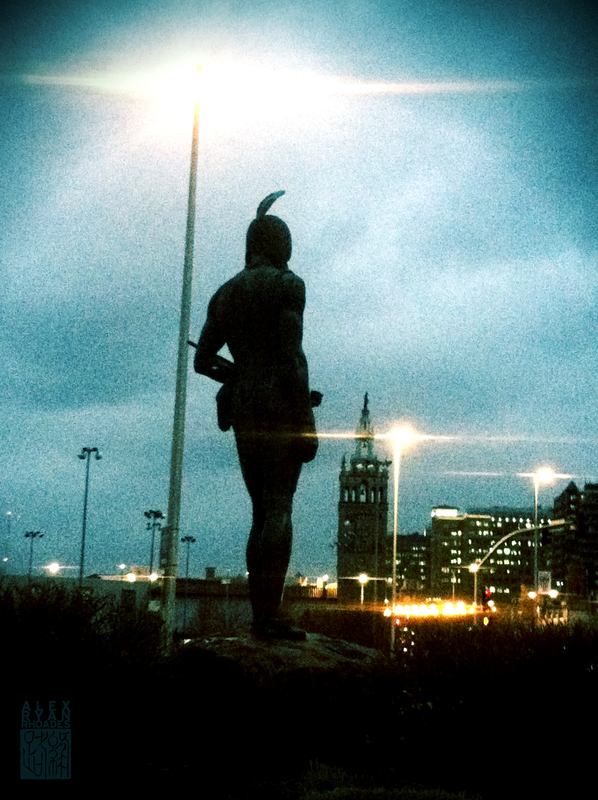 The Massasoit statue in Kansas City is probably the most poignant, however. Here, the consequences of his treaty are in full evidence as he has his back to a burger joint and stares into one of the most prominent shopping centers in the country, forced to stand watch over white people buying things over a thousand miles from where he was born. I took this photo with my iPhone on Tuesday after eating at Winstead’s. It was a cloudy day that had seen plenty of rain, a perfectly gloomy scene for our Chief. I did have to “sweeten” the photo in digital editing to get some semblance of the color I saw with my naked eye, but the light flares are “natural.” I even think the graininess adds another level of melancholy that a “clean” shot wouldn’t. Tags: Chief Massasoit, history, Jackson County, Kansas City, Missouri, Native American, photography, pilgrims, Plaza. Bookmark the permalink. It’s a good picture, and I agree about the graininess of it helping to sell the mood. Also agree about the inadvertent poignancy of what he finds himself looking over nowadays. It is, honestly, a very peculiar spot for a statue of an East Coast Native. It’s ridiculous for a Native to be there at all, but why not a prominent Midwestern Native? I haven’t really been able to find any details about the KC statue, although it looks like it was dedicated in 1979 and was moved from another location in the last decade or so. Nothing about why he was chosen, though. …this is why so many people take up drinking, isn’t it? That whole “lack of faith in humanity” thing.